So. Ever since I started blogging about kitesurfing, I have been getting absolute avalanches of questions about the sport. The sad truth is, locally, it still isn’t widely known as a “sport” but more like an added bonus to being lucky enough to live your life on a beach. Well, it is an extreme sport, but what does that mean? To break it down in non-pro terms, kiteboarding is a sport, in which the rider is attached to a harness around his waist, on which a bar is attached by a loop, this bar having either 4 or 5 lines, which are then attached to a kite, consisting of an inflatable tube and a canopy. The rider then steers the kite while standing on a board with footstraps, gliding on the surface of the water. Truth is, a kiteboarding crash course entails a lot of theory, physics and drawings (that I’m really horrible at). So there is no way I can break down the entire sport for you in one post. What I can do however, is explain to you, why kiteboarding is one of the best full-body workouts you could possibly get. First, you are attached to the kite by your waist. This mean, your core strength is vital. The kite pulls you into the direction the wind is blowing (down-wind) and you have to use your core to resist its pull. Forget sit-ups, this is the holy grail of an ab-workout. And the best thing is, you're so busy riding that you don’t even notice you are working your abdomen. YES. Second, your legs. You are riding, so you are standing and resisting the pull of the kite, yes? This means, you are flexing your leg muscles. Back leg bent, front foot pointed, toes flexed. And since, unlike surfing or wakeboarding, you will be riding with both stances as you go back and forth, HELLO LEG MUSCLES. Third, your arms – I am always asked about how much arm-strength one should already possess, in order to start kiteboarding. The truth is, it might look like you are pulling your weight with your arms, but you really aren’t. Again, you are attached to the kite by your waist, so you really only use your arms to steer the kite by the bar. Yes, that will take some strength, but no, its not like having to do a pull-up. That being said, again, kiteboarding will build your muscles over time. So if you are building up to learn this sport, no you don’t need to sign up for cross-fit or start lifting weights to prepare for this. Okay, did we cover all the bases? I do understand that this is very much a complex sport, and so I welcome you to ask away, if you have any remaining questions about kitesurfing and why and how else it may be a great thing to add to your bucket list. I will spare you from having to read this in form of a novel, so I’ll leave it at that – if you are looking for a lifestyle that will transform your body and build your physical strength – you wont find a better option. So maybe I am bias, but there is a damn good reason why I have been doing this for 8 years and why I continue to teach it. 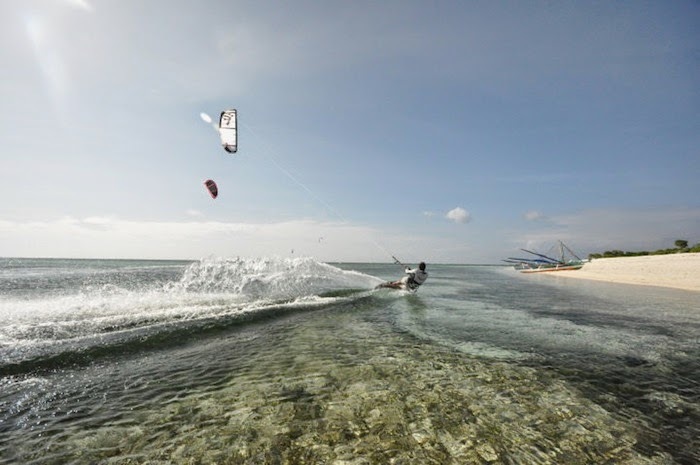 www.kite-asia.com and normeth@kite-asia.com to visit my home-base in Boracay or stay tuned to my instagram for info about upcoming kite-camps. See y'all on the water!! !